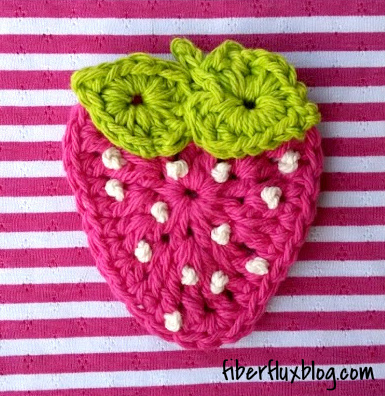 Fiber Flux: Free Crochet Pattern...Summer Strawberry Applique! 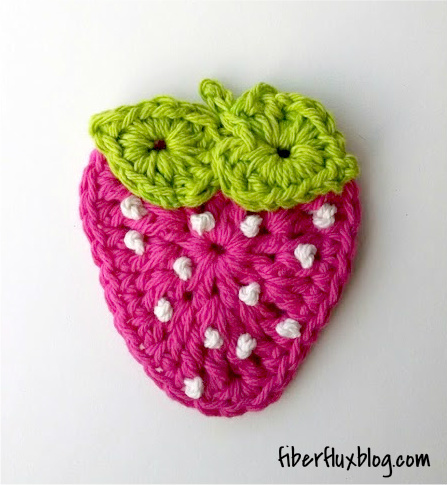 Free Crochet Pattern...Summer Strawberry Applique! Welcome warm weather with this pretty and colorful applique. Spruce up a bag, hat or other garment and you'll be ready for summer fun in no time! Round 1: Work 12 dc into the center of the ring, then join with a slip stitch to close circle and fasten off. Round 2: Chain 2 and work a dc in the first st. Work 2 dc in the next st, 3 tr in the next st, 2 hdc in the next st, 2 hdc in the next st, 2 dc in the next st, 3 tr in the next st, 2 dc in the next st, 2 hdc in the next st, 2 hdc in the next st, 3 tr in the next st, 2 dc in the next st. Join with a sl st to close round and fasten off. 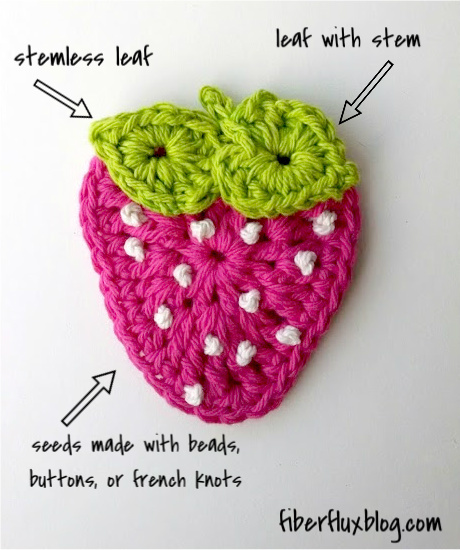 Sew or glue on beads or small buttons to the pink part of the strawberry. Alternatively, you can use white/ecru yarn to make french knots on the strawberry. Click here for a full photo and video tutorial to make your own French Knots. Weave in all ends that remain. Sew 2 leaves to the strawberry as shown in the diagram in the photo above. If you haven't yet, add seeds (beads, buttons, or french knots). See "Seeds" section above for more instructions. Attach applique to fabric with a needle and thread or to crocheted/knitted garments with a yarn needle and matching yarn. All finished! Thank for all your lovely patterns! This one is very sweet. Absolutely adorable!!! Pinned! Thanks for sharing pattern! Love the strawberry! Thanks so much for the pattern. I just love strawberries and crocheting and your strawberry is beautiful. I am going to have to make quite a few of these. Just in Time for Strawberry Season in another Month... so cute, I am already thinking of ways to use this for My Granddaughter, she will love it...On a T-shirt, Headband or a small Tote bag... I had better get Crocheting...Thank you for the Pattern...! ! ! ! Used the strawberry applique on a tee--just in time for our strawberry festival. Now, since you are so creative with tiny things, do you have a lima bean applique--for our lima bean festival?